WASHINGTON (Feb. 27, 2015) -- Iraq's military and Kurdish Peshmerga, after being trained by U.S. military advisors, will be in the lead in what is expected to be a complex and challenging battle to reclaim the country's second largest city, Mosul, from Islamic State of Iraq and Syria, or ISIL, terrorists, who have held it since June, the Army's chief of staff said, Feb. 25. "One of the lessons I think we should have learned, is that it is important to have indigenous capability involved. 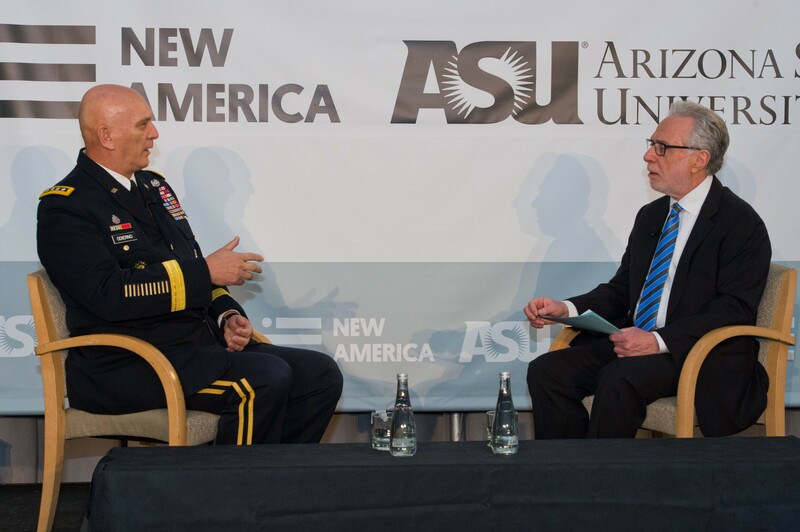 This is really about their country," Gen. Ray Odierno told CNN's Wolf Blitzer as part of a "Future of War" conference here. "It is important for us to assist in any way we can. But I think it's important that they do this." As part of Operation Inherent Resolve, several thousand U.S. military advisors are in Iraq training Iraqi forces and providing them with equipment as airstrikes conducted by the U.S.-led coalition continue on ISIL targets in Iraq and Syria. But Odierno said more U.S. support is needed before an assault on Mosul can begin, and that a defeat of ISIL is not going to happen quickly. "This is going to be months and months," Odierno said. "It's a very difficult situation." Removing ISIL from their stronghold in Mosul will be complex, he said, and time consuming, because as an enemy they are not easily identifiable - they hide among the civilian population. "They will do anything," Odierno said. "There is no limit to what they will do to survive. They could have hundreds of suicide bombers, booby-trapped buildings - they could have all kinds of things. And the suicide bombers are everything from men, to old women, to young children. This type of warfare is something that is despicable to us, but something very natural to them. That's what makes this challenging." As many as 25,000 Iraqi soldiers may head back to Mosul to try to take the city back from fewer than 4,000 ISIL fighters. And Odierno said he thought they could find success in that endeavor, based on their recent performance. "We are seeing great progress over the last couple of days, over the last week," he said. "We've seen them do successful operations in western Iraq and Anbar province. They have made some improvements. We will wait and see." Complicating their fight against a smaller ISIL force is the challenge of eliminating an enemy that hides in the shadows - or behind innocent civilians. "What it goes back to is that it's not that there are 5,000 fighters lined up, it's two, three four, five thousand fighters intermixed among the population, and who use incredibly unconventional methods in order to be successful," Odierno said. "For them it is about making this operation as long as possible, it's about inflicting as many casualties as possible, about it's about going after the will of the military forces that they are facing." Odierno said ISIL doesn't have to defeat Iraqi forces, but rather stretch out the fight. "It's about making the populations suffer, it's about inflicting casualties on the enemy," he said. ISIL has taken a wide swath of territory spanning the Iraqi-Syrian border and success in pushing back the Sunni group will ultimately require nations of the region working together, Odierno said. "We are starting to see the leaders in the Middle East start to coalesce around ... this is a problem we have to deal with. I think that's important. We need them all to be involved." The U.S. Army will be involved in raising an opposition "Free Syrian Army," which will be trained in the region, and has been vetting possible fighters to take on the battle against ISIL. Odierno expected training to begin in March or April, and to last about four to six weeks. "There is a good plan in place," he said. "These units are being built to help us to put pressure on ISIS and we want to put pressure on from multiple fronts," he said. "This allows us to open another front against ISIL."